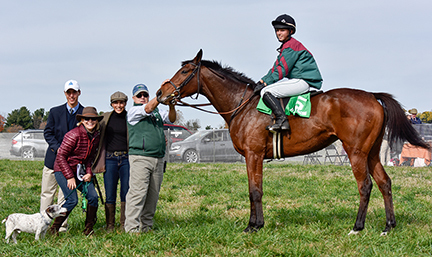 It seems that the Brophy family of Fair Hill has produced yet another young jump jockey who possesses not only great riding skills, but also excellent horsemanship, sportsmanship, talent, and dedication to the sport of steeplechase racing. These are the requirements for the Maryland Steeplechase Association’s Jonathan Kiser Memorial Scholarship, and in 2017 Ella Brophy became the second Brophy child to win this award. “I feel really honored to have been chosen,” said Ella. “It is nice to know that people in this sport think highly of my horsemanship and dedication.” Ella’s older brother John won in 2015. Like many junior jockeys, Ella grew up in the saddle, riding ponies in the hunt field with Cheshire and River Hills before beginning to race in 2010. Her first race was in the Small Pony division at Mr. Stewart’s Cheshire Foxhounds Point to Point in March of 2010. She rode her own pinto pony Sugar Booger and was trained by her mom Laura Brophy. Laura taught herself to ride early in life and went on to teach others as well as train young horses. That first year, Ella and Sugar Booger ran fourth twice and fifth once, and even though Ella never won a race that season, she was hooked. “I just seemed to grow into it. From pony races at first to the field master chases this past year,” she said. In 2013, Ella took over the ride of Prince Caspian from her brother. Together, Ella and the medium chestnut pony won at Cheshire, Brandywine and Fair Hill. The following two years, Ella primarily rode Modernly Millie. 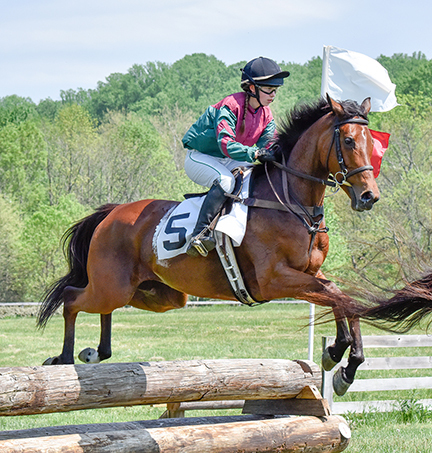 The large pony was first raced by John, and Ella found success with her in 2014 and 2015, winning several Junior Field Master’s Chases, including the Large Pony division at the Maryland Junior Hunt Cup in 2015 and the 2014 Pennsylvania Hunt Cup Junior Field Master’s Chase. Millie was sold to the Fenwick family and continues to win with Tommy Fenwick in the irons. After taking a break from racing in 2016 due to a concussion right before the season began, Ella was finished with ponies and ready to take on the junior horse races. 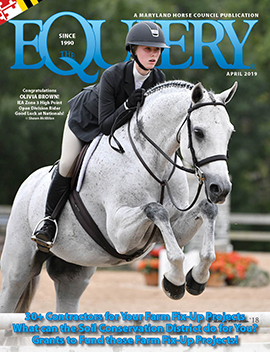 Enter the Thoroughbred Squeaky Ceci.